A five cards of the same suit from 10 to ace. The highest hand possible. Five card the same suits in sequence. Combination of Three of Kind and Pair. Any five cards of one suit. Five cards of mixed suits in sequence. The suit does not matter. The hand with high card wins. If two players holds the same combination: pair, 2 pair, three cards of the same rank or 4 cards the same suit, the strongest card or kicker determine the winner. For example: If player A win with combination 2x Two cards of a same rank with high card Queen. Texas Hold’em – the most popular type of poker. The rules are simple, so even newbies can learn them in a few minutes. In the beginning of the game players are dealt with 2 cards face-down, and 5 community cards laid are face-up on the table. The game consists of 4 betting rounds. Players could make combinations using their own and community cards. Player should win the pot by making the high hand. But this is not the only way to the victory. Players can bluff (show other players that they have stronger hand than it appears to be) to convince other players to fold their cards and refuse of capturing the pot. Before game starts, two players to the left of the dealer must post Small and Big Blinds. 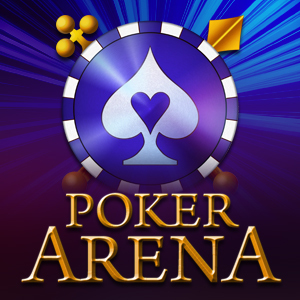 In the online games instead of real dealer you will see the button – chip of the dealer. Button indicates the turn of cards distribution and wagers in the game. The Blind is necessary for making the pot. The first three face-up cards on the board and following betting round are flop. Players can use these cards to make five-card poker hands. In the third round they open 4thcommunity card. Four community cards on the table is turn. Turn is the next to last round of betting. In this round dealer reveals last 5thcommunity card – the river, and the last betting round begins. All the players who remain in the game reveal their hands. The player with best hand wins. If two players shows the same hands, the pot is shared between them. If you play poker first time, we recommend you to get online tutorial. It means that player call all his chips. You can use it in situations when you don’t have enough chips to bet or in No-limit games as a particular strategy. All-in gives you a potential chance to win your share in the bank, including the last bet. All subsequent chips will be added to the side pot. The Blind is an initial bet posted by player before getting the cards. In some kinds of poker player must do the blind after first dealing of the cards.There are a big blind and small blind. A marker, that indicates a dealer position in the online games is called button. Button indicates the order of dealing cards and betting in games, where player’s position is important. The amount of money required to become involved in a game. In tournaments «buy-in» means the sum you need to pay to participate in the game. There is a maximum and minimum amount of chips, required to play. To match a previous bet. If there is no bet on the table, you can check (bet nothing). The cards dealt face up in the center of a table and shared by all players. In Texas Hold’Em and Omaha there is always community cards. If you don’t want to continue the game, you can fold. Three face-up cards in Texas Hold’em or thirst three cards which were simultaneously dealt. A hand with three cards of one rank and two of a second rank. Combination of cards, used during the game. Also the name of the round consisted of dealing, shuffle and betting of cards. The game, where to players are playing face to face. A no pair card of highest rank in combination. One of the most popular variations of Texas Hold’em, where every player gets two cards at the beginning and can use 3, 4 or 5 community cards for making combinations. Card that does not take part in combination, but may play an important role: 1) it can bring higher card 2) controls bluffing of opponent 3) if players have same combination, kickers will be compounded. The higher kicker you have, the more confident you may play. Main pot. There is also a side pots for all-in players. The tournament that features many players with several tables and starts from the same amount of chips, till the one player get all the chips. Payout is based on the number of players and indicated on the page «Tournaments». In such tournaments time of the start chosen ahead and registration of participant in advance required. A game with no-limit betting structure. Players can raise the bet by any amount. In this type of poker each player is dealt four cards and the amount of community cards is five. Players can use their 2 cards and 3 community cars for making combinations. That means that you’re in dealer position in Texas Hold’em or Omaha. Two cards, dealt face- down in the beginning of the game. The sum of chips that players wager during a game. To increase the size of the bet of previous player. An amount of additional chips purchased in the game before or after the round. It used both in betting games and tournaments. The last (5th) community card. It also called a Five Street. The dealing of cards and following wagering. The dealing of River and following betting is called Round. The moment after the last bet, where players expose and compare cards to indicate the winner. Side-pot appears when 1 or 2 players go All-in. Side-pot is available for players who does not gone all-in too. There are cases when few Side-pots exist. Tournament, which starts when particular amount of players join the table.